Extending the Bezares transfer boxes' application range, we introduce our new double-acting pneumatic piston version of our well known 1:1.21 Transfer Box. This new system ensures the correct position of the pneumatic piston, reducing the risk of damages in the case of an accidental pressure loss in the circuit. 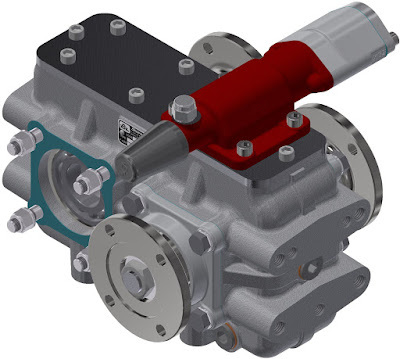 The new 1:1.21 transfer box has two auxiliary outputs that can be combined in 3 different configurations: two pumps, two flanges or pump and flange. These auxiliary outputs can be mounted to the right side or to the left side of the vehicle, according to the customer's needs. This new version comes in addition to the other two types of central unit's actuators (mechanical and single effect pneumatic) and, optionally, is offered with horizontal assembly support.